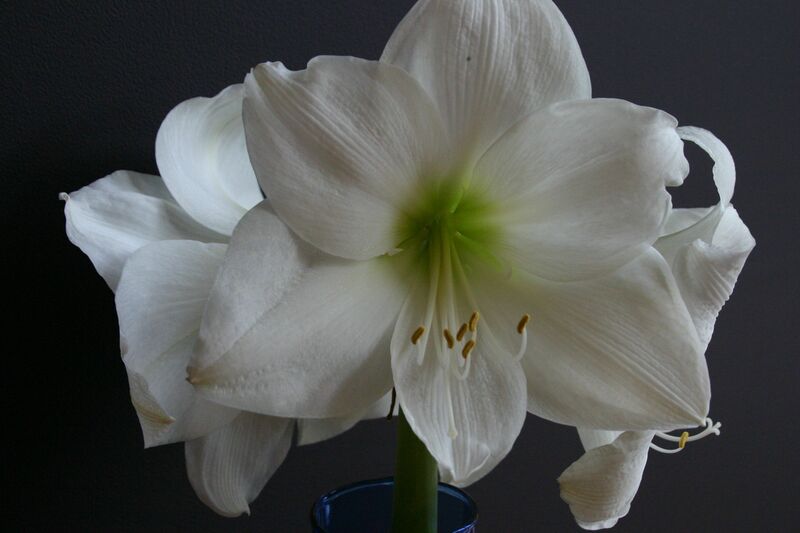 Amaryllis are designed to make us happy in winter. 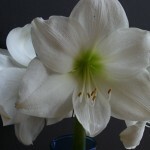 This one is Amaryllis ‘Inotaki’ given to me as a?Christmas?present by my friend Mark Disero. He also gave me lots of instructions that sounded really smart: ?put it in a largish pot (about 10 inches wide) ?so it’s easy to put it outside for the summer in a larger pot you don’t have to water so often. He recommended using a metal plant support from the dollar store since they are so top heavy. Well I was a bad kid: I did none of the above. I didn’t plant it immediately. I found a small pot after the bulb had been sitting around in a warm house for days and days. Then I threw it into the pot with some mulch and watered it when I remembered. It grew like Topsy and fell over with a whacking great thump one night wrecking a really nice container in which it had been sitting for the holidays. Top heavy is putting it mildly. ?And this is how it has rewarded me: ?absolutely heartstopping?gorgeous. Mark recommends letting it go into dormancy and putting it out in the garden and then bringing it back into the house next autumn. It’s so magnificent I certainly will. I’ve been going like blazes trying to get stuff written (House & Home, Chatelaine and work for clients)?so that we can leave town on Tuesday morning. We’re heading to California. Out of this snow and wind and into what I hope will be days and days of sun. I just want to be vaguely warm again. ?I will be blogging from there a little more attentively than I have been I hope. There are a ton of botanical gardens in this area and want to get healthy and walk the beach for miles every day. Enjoy the warmth Marjorie! A little California sun and some California wine sound perfect to one who is buried deep in Stratford snow. I think we as gardener’s are doomed to ‘go it ourselves’ and learn the hard way. Almost verbatim I did the same thing with an Amaryllis – smaller than needed pot; no support…. luckily mine didn’t topple over, and even now its trying to send a third flower stalk up….. but that’s the beauty of gardening…. sometimes our worst efforts are rewarded with stunning displays of beauty! Try and enjoy yourself in the sun and surf…. you do deserve time to bask in the sun. Enjoy!